HEMA Amasra power station is a proposed 1,320-megawatt (MW) coal-fired power station in Bartın province, Turkey. The proposal is different from the Amasra Bartın power station. The undated satellite photo below shows the plant's site, which is near Gömü village, Amasra district, Bartın province. The second phase of the plant would be built to the north of this site. The power station has been proposed by Hema Elektrik, a subsidiary of the diversified Turkish company Hattat Holding. The plant would be built near Amasra in the Bartin province of northern Turkey, on a site less than a mile from the shore of the Black Sea. The plant would apparently be a mine-to-mouth plant, with coal coming from Hema's proposed Amasra Hardcoal Project (which holds an estimated 573 million tons of reserves). After telling local residents in 2005 that it planned only to build a new coal mine in the area, and not a coal power plant, Hema applied in 2006 to Turkey's Energy Market Regulatory Agency (EPDK) to build a 654-MW coal-fired plant in Amasra, then increased that permit to 2,640 MW in 2009. Indeed, the size of the proposed plant could potentially be increased: while in January 2010 Hema's website stated that it would be 1,100 megawatts, in March 2012 the company's website referred to it as a proposed 2,640 MW plant. While the company's website refers to the current proposal as being 1,320 MW, at an agreement signing ceremony for the plant Turkish energy minister Taner Yildiz flagged that the project could increase to 4,000 megawatts in capacity. The EIA hearing for the proposed 1320 MW integrated power station was held in September 2013. The power station has been opposed by local residents, who challenge its permitting. The Turkish Ministry of Environment and Natural Resources rejected the plant's environmental impact assessment, in an apparent victory for opponents of the plant. Hema has stated that it will continue to pursue the project. In April 2014, the plant's environmental permitting process was apparently still underway. The project has gone through several iterations, with different names: "Amasra power station", "Bartın power station," "Hema integrated power station," and "Western Black Sea (Batı Karadeniz) integrated power station." Different iterations of the project have been proposed by different companies, all of which are however subsidiaries of Hattat Holding. Turkish MP Muhammet Rıza Yalçınkaya, a prominent critic of the project, has demanded clarity from Hattat on which proposal it was actually pursuing. According to CAN Europe, licenses are being pursued for the HEMA Amasra power station and 1,200 MW Amasra Bartın power station (which was shelved in 2017). In January 2016, an Engineering, Procurement and Construction contract (EPC) for the HEMA Amasra plant was signed between Hema Elektrik Üretim Anonim Sirketi and Dongfang Electric Corporation of China. The contract price is a lump sum of US$900 million. In 2016, more than 2000 local people and some NGOs filed a court case against a positive EIA decision for the plant. Following that, the project's environmental plan was revised to make it look suitable for a coal power plant. Local groups and some NGOs communicated their objections to this development, and if the objections are ignored they'll file another court case against this development. In August 2016, Hattat Holding’s chairman, Mehmet Hattat, issued a press release stating that, because of so much opposition on the ground, the project’s EIA process is taking too long and the promoters are finding it difficult to attract international finance. According to locals, in February 2017 Credit Suisse was approached by the company for financing for the coal mine, and a Turkish consultancy firm, 2U1K, conducted a survey and interviewed local communities on behalf of the Swiss bank. Residents of Bartın protest against the proposed Amasra Bartın power station in 2010. The proposal to build the plant has faced significant public opposition, both in Amasra and in the provincial capital of Bartın, mainly on the grounds that pollution from the plant would hurt tourism and damage the local environment. Protests have been led by the Bartın Platform, created in April 2010, which has coordinated amongst many stakeholders in the region that are opposed to the plant. 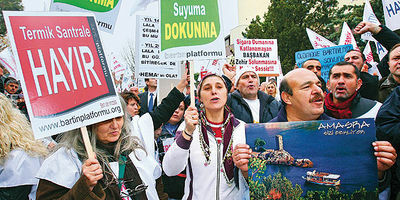 10,000 residents of Bartın held a protest against the plant in April 2010, and later that year a petition against the plant collected 30,000 signatures. Public permitting meetings have also been disrupted by local residents. Hasan Cengiz, chairman of the Amasra Association for Culture and Tourism, noted in 2012 that the plant was trying to break people’s resistance by employing some town residents in its mining and natural gas factories in the region. In July 2013, Muhammet Rıza Yalçınkaya, an MP from the opposition Republican People's Party, called on the Ministry of Environment & Urban Planning to reject the project. In May 2014, MP Yalçınkaya demanded further information from the Ministry of Environment & Urban Planning on the ongoing permitting process. Despite the "Danıştay 14. Dairesi" court's decision that the proposed coal preparation facility should be included in the Environmental Impact Assessment (EIA) for the power plant, in 2017 Hattat Holding submitted a separate EIA for the preparation facility. Bartin Platform claim consideration of this separate EIA would be unconstitutional. A court case by the Bartin Platform requesting the EIA be cancelled lasted a year and a half but was rejected in May 2018 by the Zonguldak Administrative Court. In February 2019 the Supreme Administrative Court found that the plant's EIA was "not in conformity with the law" because it failed to assess the project’s detailed environmental impacts. "This decision showed that the EIA process was illegal and that our claim was correct," said Erdoğan Atmış of Bartin Platform. Sponsor: HEMA Elektrik Üretim A.Ş. ↑ Amasra Hardcoal Project, Hattat Energy and Mining website, accessed Nov. 2017. ↑ Anelia Stefanova & Daniel Popov, Üzerimizdeki Kara Bulutlar: Türkiye’nin Kömür Sevdasının Karadeniz’deki Yerel Ekonomiler Üzerinde Oluşturduğu Tehdit, Greenpeace Turkey, Oct. 2013, pp. 6-10. ↑ 3.0 3.1 3.2 3.3 Pearl of the Black Sea Coast Faces Threat from ‘Black Diamonds’, Today's Zaman, Apr. 8, 2012. ↑ "About Us", Hema Enerji website, archived from January 2, 2010. ↑ "About Us", Hema Enerji website, archived from March 9, 2012. ↑ Turkey’s Hema Signs Deal to Build Coal-Fired Plant, Argus Media, February 23, 2012. ↑ Bartınlılar termik santral mücadelesini kazandı, Greenpeace Turkey, Sept. 19, 2013. ↑ Amasra "kömür" olmaktan, son anda kurtuldu, Milliyet blog, Sept. 20, 2013. ↑ 10.0 10.1 Yalçınkaya: 'Termik Santral ÇED Süreci İle İlgili Bilgi İstedi', Bartin Post, May 10, 2014. ↑ Yalçınkaya: İsim karışıklığı giderilmeli, Bartin.info, July 18, 2013. ↑ Public Outcry in District of Amasra of Bartin Province on Black Sea Coast of Turkey, Energy News Turkey, Nov. 25, 2010. ↑ Yalçınkaya, Termik Santral Projesinin İptal Edilmesinin İstedi, Haberler, July 18, 2013. ↑ Bartın Platformu: İnceleme Değerlendirme Kurulu Toplantısı, Anayasa'ya aykırı, Birgün, Nov. 14, 2017. Amasra coal mine and power station, Turkey Banktrack, 2017.